UPDATE 3/2/18: Here is the link to the Inclusionary Housing Calculator mentioned by City Planner Demi Kolke during the meeting. UPDATE 3/19/18: Lawrenceville United sent us a City Planning Presentation on Pittsburgh’s zoning process after the Housing affordability forum. Are you worried that rising housing costs mean you won’t be able to afford to live in Bloomfield soon? Care about residents in Bloomfield being able to stay in Bloomfield? 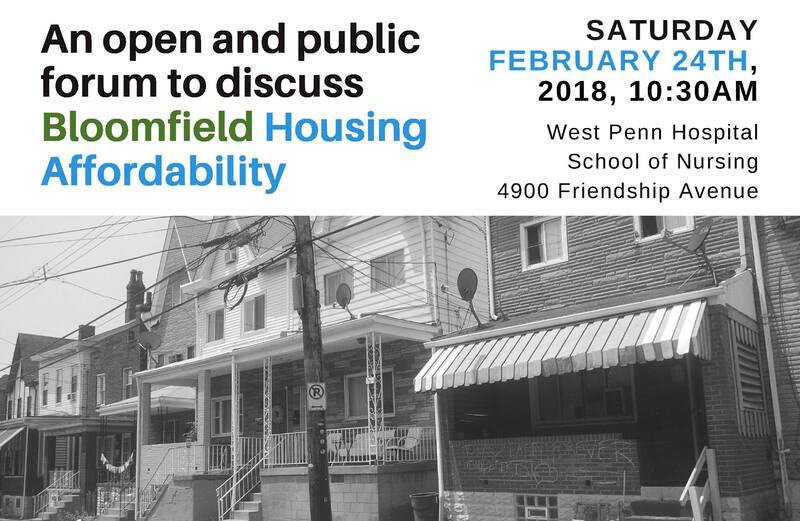 Join us this Saturday to share and hear stories, and learn about the tools Bloomfield can use to create and maintain affordability. Find out how affordability issues are affecting your older neighbors and how you can influence change. Breakfast and conversation begins at 10:30am, Presentations and q&a session begins at 11:00am. Childcare available with RSVP of the number of children. Accessible entrance located in the rear of the building. VOLUNTEERS NEEDED to help with flyering! Reach us through FB messenger or by emailing info@bloomfieldnow.org.